Karl Huttenmeister – a prosthetic technician for 23 years learnt his craft on the job –‘apprenticeship style’. He currently works at Orthopaedic Techniques in Fitzroy, Victoria. 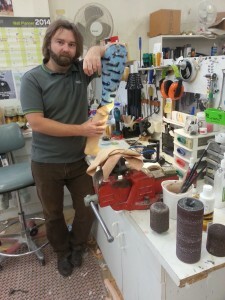 How did you get involved in Prosthetics and Orthotics (P&O)? It was purely the idea of getting paid to make something amazing that could help change another person’s life; with my own two hands. Another reason was to learn about materials and techniques I hadn’t yet mastered. What are some of your younger clients’ expectations of their prostheses (age and gender dependent)? Children expect much more than the adults. They not only require the prosthesis to function and fit perfectly (which is usually the main concern of the parents, and for us) but they also want to ‘fit in’ by ‘standing out’. Removing the stigma has always been a challenge, but I think things are changing for the better. This applies to girls and boys, of all ages. What are some of the more common concerns for parents, and what is your advice to them? Parents’ concerns vary. Some are concerned about every detail, from cast to final fit, whilst others are happy to put their faith in us to do the best for their child. Artificial limb breakages and loss of volume resulting in skin breakdowns seem to top the list. Prosthetic limbs are in no way indestructible and some children manage to destroy them within a matter of weeks. Kids will be kids. I’m glad they don’t hold back or let their new limb stop them from enjoying their childhood. What information do you provide to parents whose children are scared of having a prosthetic cast taken? How can parents best prepare their children to help reduce stress levels? I have found that getting the cast done as quickly as possible helps, as does ensuring the child is ready; so not too tired or after a long day. Mornings usually are better as the stump is at its best and involving the child in the finishing process helps as well. Something as simple as having children show the clinician which design or pictures they would like helps to engage them in the process; they feel excited about what they can show their friends. What advances have you noticed in paediatric prosthetics in the last 5 to 10 years? I have seen so many changes in prosthetics. Ten years is a long time in this industry in relation to innovation and new materials. Liners and socket interface variations have moved forward in leaps and bounds. Components have made quite significant advances; however as far as children’s prosthetics go, the ‘style’ of fittings has remained very similar. That said I am able to construct the sockets with much stronger and lighter materials which means children use far less energy controlling the limb and the added strength gives them more confidence to do all the things their friends do. What improvements in children’s prosthetics would you like to see in the future? The biggest improvement would be to have high activity components like knees and feet. It would be great to see children access newer products like aqua legs (a water proof cover that can be slipped on your child’s current prosthesis) or water legs (water proof prostheses) – imagine hearing your child asking “can I play in the water?” and the parent being able to answer “Yes, you can!” with all the confidence in the world. A lot of people ask me this and I have to say, it’s the look on the kid’s faces when they first see their cool new leg.